Yet another Andrew Podnieks offering in 2011 is Sid vs. Ovi: Crosby and Ovechkin - Natural Born Rivals . The book is published by Fenn/McClelland and Stewart. Even before Sidney Crosby and Alexander Ovechkin began their NHL careers in 2005, the two players were rivals. They first met at the World U20 (Junior) Championship, playing for the gold medal, and ever since they have been opponents in the NHL and international arenas. No two star players could be so different. Crosby is the consummate captain and team player, the responsible face of the NHL. Ovechkin is the loose cannon on ice and off, capable of a great play or a cocky comment. 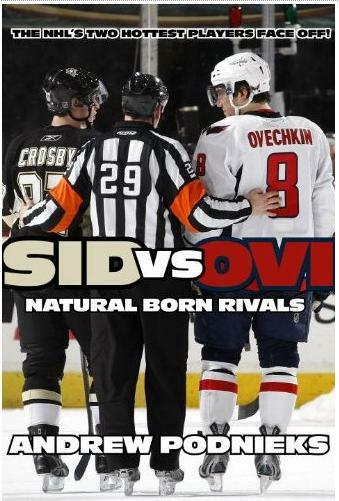 Sid vs. Ovi traces this intense rivalry game by game, year by year, from 2005 to 2011 and beyond. Their biographies are given consideration alongside their in-game performance and career development to present a clear picture of their lives, their careers, their league, and their countries. Hockey fans can well be divided into those who prefer one or the other of this pair of scintillating talents. But one thing is certain – the presence of one inspires the other to greater heights.